Bollywood superstar and the undisputed king on Indian cinema, Salman Khan on Wednesday released a new poster from his upcoming film Bharat in which he has introduced the character of Katrina Kaif who is the leading lady in the film. Bollywood superstar and the ultimate box office king Salman Khan has unveiled a new poster from his upcoming film Bharat introducing Madam Sir ie Katrina Kaif who has been paired opposite the Dabangg actor in the film. In the poster, we see Bollywood Bhaijaan Salman Khan donning a serious look and is looking handsome as ever in a mustache and a classy hat! The gorgeous Bollywood beauty, Katrina Kaif, on the other hand is stealing the show in a formal white shirt with grey formal pants and a brown belt. Her curls and the expressions will leave you mesmerized. They are both dressed according to the 70s as the much-anticipated film Bharat is set in the backdrop of the 70s and it is all about a journey of a man and a nation together. Soon after Salman Khan shared the poster on social media, fans are eagerly waiting for the trailer of the film to get released as it is one of the most awaited films of this year just like all other Salman Khan films. 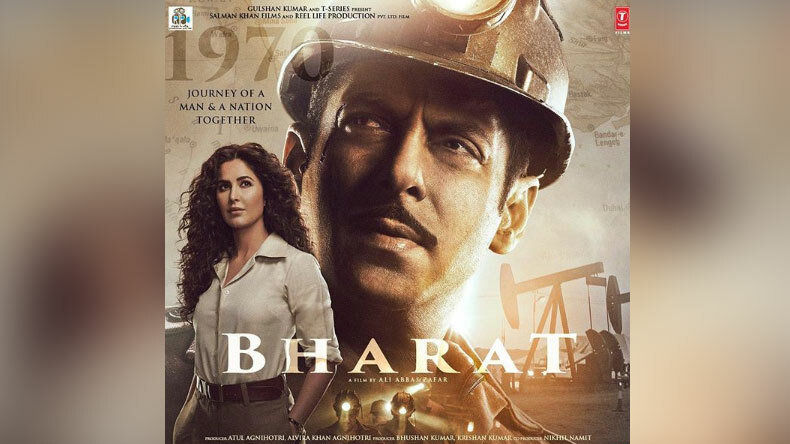 Bharat, which stars the Bollywood megastar Salman Khan and Katrina Kaif in the lead roles is the Hindi adaptation of South Korean film Ode to My Father. The film, which has been directed by Ali Abbas Zafar reunites Salman Khan, Katrina Kaif and Zafar once again after their successful collaboration for blockbuster film Tiger Zinda Hai which had taken box office by storm! Bharat, which also stars Tabu, Disha Patani, Sunil Grover, Jackie Shroff, Sonali Kulkarni and Satish Kaushik in key roles is slated to hit the theatres on June 5 this year on the special occasion of Eid. Fans have high expectations from the film as Salman Khan, who has been ruling Bollywood and box office for the past one decade, is known for delivering blockbuster films.